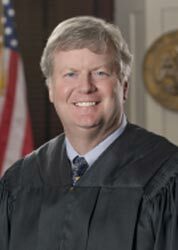 Judge T. Kenneth Griffis, Jr. will become the next Chief Judge of the Mississippi Court of Appeals, Supreme Court Chief Justice Bill Waller Jr. announced today. Judge Griffis, 57, of Ridgeland, will begin his service as administrative head of the Court of Appeals on Jan. 1, 2019. He will take over the leadership position from Court of Appeals Chief Judge L. Joseph Lee, who will retire on Dec. 31. The Chief Justice of the Supreme Court selects the Chief Judge of the Court of Appeals. With the Dec. 31 retirements of Chief Judge Lee and Presiding Judge Tyree Irving, Judge Griffis will become the longest serving member of the Court of Appeals. He has been a member of the court for 16 years. He was elected in November 2002 to District 3, Position 2, and took office in January 2003. Chief Judge Lee selected him as a presiding judge on March 3, 2011. The Court of Appeals handles cases in three-judge panels, although all 10 judges of the court vote on decisions. Presiding judges preside over the panels during oral arguments and during the internal discussion of cases. Judge Griffis will become the sixth Chief Judge of the Court of Appeals. The court was created by the Legislature and began hearing cases in January 1995 to relieve a backlog of appeals. It is an intermediate appellate court, deciding cases assigned to it by the Supreme Court. Judge Griffis is a native of Meridian. He earned accounting and law degrees from the University of Mississippi. He attended Meridian Community College and Mississippi State University - Meridian Branch. He was a Certified Public Accountant from 1984 through 2007. Judge Griffis is admitted to practice law before the United States Supreme Court, the Fifth Circuit Court of Appeals, the United States District Courts of the Northern and Southern Districts of Mississippi, and all Mississippi state courts. He is a member of the Mississippi Bar, the Magnolia Bar Association, the Madison County Bar Association, the Capital Area Bar Association, and the Rankin County Bar Association. Judge Griffis is also a Fellow of the American Bar Foundation. He previously served as a member of the Mississippi Supreme Court's Rules Advisory Committee and as chair of the Bench Bar Committee of the Mississippi Bar. He also served on the Committee on Continuing Judicial Education and the Committee on Electronic Filing and Case Management Systems. He was an adjunct professor at Mississippi College School of Law, Belhaven University, the University of Mississippi School of Law, and Meridian Community College. Judge Griffis and his wife, Mary Helen Griffis, are the parents of five boys. They live in Ridgeland and attend Christ United Methodist Church. Judge Griffis has served as a youth Sunday School teacher, a Cub Scout leader, and a coach for more than 80 youth sports teams, including baseball, basketball, soccer, and hockey.